On a recent trip to Chicago, Bob and I had the delightful (and delicious!) opportunity to attend an Indian cooking class taught by Chef Ranjana Bhargava. 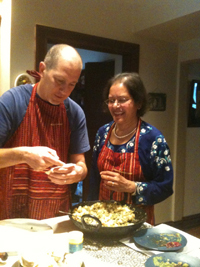 We learned how to make samosas, daal, saag paneer, raita and a few other Indian specialties. But more than just learning how to make Indian food, we got to spend time with Chef Ranjana, which is a delightful experience in itself. 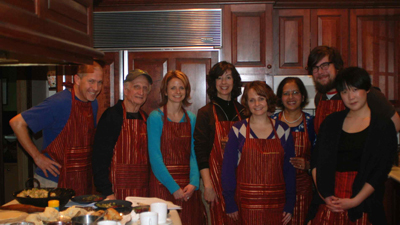 Ranjana Bhargava has been teaching her authentic Indian vegetarian cooking classes in Chicago for more than 30 years. In addition to cooking and raising a family, Ranjana also has a 30-plus year career in social services, working for Chicago public schools, the Chicago public library, founding Apna Ghar, a shelter for Asian women, and much more. To say that Ranjana is fascinating would be an understatement. Chef Ranjana offers her classes (www.indiancookingclass.com) in her home, a house in the historic Jackson Park Highlands district of Chicago’s South Shore. I thought it might be a little awkward to take cooking lessons in a private home, but I couldn’t have been more wrong. Upon our arrival, as we removed our shoes and coats, we were immediately put at ease by Ranjana and her husband and their wonderful hospitality. The class began with Ranjana offering tea to Bob and I and the five other students in our class. After I asked a few leading questions, Ranjana told us a little about herself (Spend any time around me and I’ll ask you a leading question. Some call me inquisitive, others just plain nosy). Ranjana came to the United States from India in the late ‘60s, to marry her husband in an arranged marriage. At the time she did not know how to cook, as growing up in her home children did not spend time in the kitchen. So she taught herself, and what an amazing chef she has become. Everything Ranjana and the rest of the class cooked, we ate. And if someone asked about a particular dish, and Ranjana happened to have the ingredients in her refrigerator, she was happy to switch gears and add another item to the day’s menu. In one case, because one student did not eat processed sugar, and we had made a sugary dessert, Ranjana got fresh strawberries out of her fridge so he could eat something sweet. We learned about Indian spices, chutneys, and many vegetarian dishes (Ranjana and her husband are vegetarians, and she only teaches vegetarian cooking), all authentic and all delicious. As a group, we also talked about our lives, our families, our careers, the types of food we like, and more. It became less a class and more a gathering or dinner party, people cooking together, eating together and socializing. Chef Ranjana and her hospitality are what made it so delightful. If I lived close to Chicago, I’m certain I would take more lessons, to learn how to cook more Indian dishes, and to spend more time with Ranjana Bhargava.